Reuters total: $350bn/day in Dec, up +0.9% on Nov, and up some +9.2% compared to Dec 13 level of $321bn/day. Reuters Spot: $106bn/day in Dec, down -11.7% on Nov, and only up 5% compared to Dec 13 level of $101bn/day. Reuters Other Products: $227bn/day in Dec, up +7.5% on Nov, and up 11.4% compared to Dec 13 level of $219bn/day. 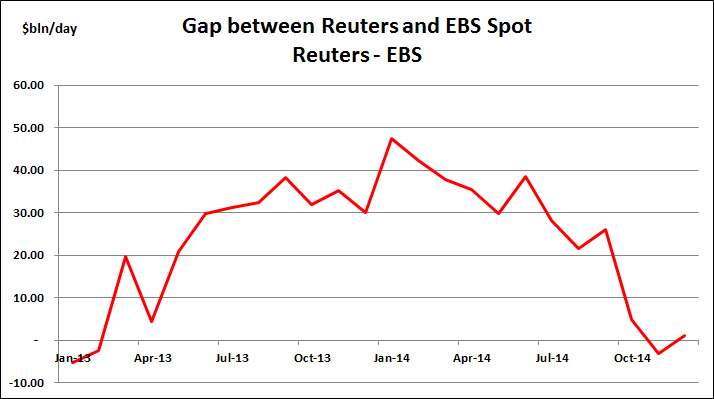 Year-end slowdown affected all platforms, and nothing particularly interesting to note here, although the battle between Reuters and EBS continues, with EBS having eroded a near $50bln/day volume advantage that Reuters had built up this year as can be seen from the last chart below. According to CLS the FX settlement platform, volumes surged on black Thursday to $9.2trn/day, and sources at EBS commented in a WSJ article that EBS volume nearly tripled to $300bln that day, so it will be interesting to see whether Reuters announce their volumes for that fateful day, and how they compared.